Escarpment The Edge Pinot Noir is a popular New Zealand Red Wine available from Waitrose Cellar in 75cl to buy online. Visit Waitrose Cellar for the best price for 75cl of Escarpment The Edge Pinot Noir or compare prices on our other New Zealand Red Wine products. Perfume, elegant fruit flavours, and soft ripe tannins are all hallmarks of this exceptional Pinot Noir. It will cellar gracefully for up to 10 years. Perfect weather in Martinborough during flowering in December 2008 resulted in an ideal crop. A normal warm dry summer followed creating the distinctive Escarpment style showing complexity, attractive texture and the perfect mix of black, red and green fruit flavours for which Pinot Noir is celebrated. The fruit was hand harvested, then gently handled without pumping until it was pressed. Hand plunged every 8 hours then left to macerate on skins for an average vat time of 18 days. It has been aged completely in French oak barriques, of which 30% were new, for 11 months. The Escarpment vineyard is planted on alluvial gravel terraces at the foot of the Aorangi mountains. There, the legends tell us, the Maori navigator Kupe abandoned three canoes after discovering the new land that his wife called Aotearoa and we now know as New Zealand. Kupe's image features on our label and his pioneering journeys inspire our winemaking. Escarpment is a partnership between the Kirby and McKenna families. Where to buy Escarpment The Edge Pinot Noir ? Escarpment The Edge Pinot Noir Supermarkets & Stockists. You can buy Escarpment The Edge Pinot Noir online in most retailers and find it in the New Zealand Red Wine aisle in supermarkets but we found the best deals online for Escarpment The Edge Pinot Noir in Waitrose Cellar, TheDrinkShop, Amazon.co.uk, and others. 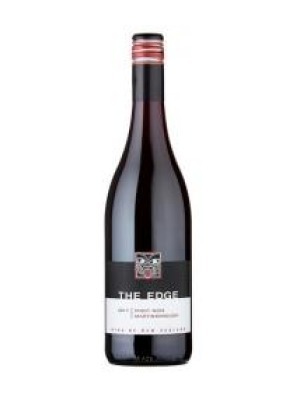 Compare the current price of Escarpment The Edge Pinot Noir in 75cl size in the table of offers below. Simply click on the button to order Escarpment The Edge Pinot Noir online now.